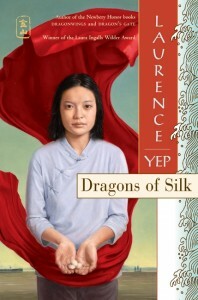 Laurence Yep is a fabulous chronicler of Chinese culture and Chinese American culture. This particular children’s book includes both, as it traces a family from 1835 in China to 2011 in America. In that respect, this is a weighty children’s book, best read by children 12 and up. There is a fair amount of sadness in the stories that are told, a great deal of unfair treatment. Yet, there is a nobility and a sense of sacrifice that is riveting. I love the parts of this children’s book that are set in old China, as I personally love reading about that older culture. The thread of following generation after generation after generation is an important one, as we come to see how we are shaped by our ancestors, even ones we have never met. This is an significant message for all children, not just those from China. Honoring and incorporating our ancestry makes us who we are. I could certainly see this children’s book used in a classroom or home school. However, it is a wonderful independent read, especially if your child has any connection with China at all. As always, Mr. Yep is masterful in his ability to tell a story and use language effectively. This particular children’s book is subtitled “Golden Mountain Chronicles: 1835-2011”, and is part of a series of several other books about Chinese families before and after immigrating.